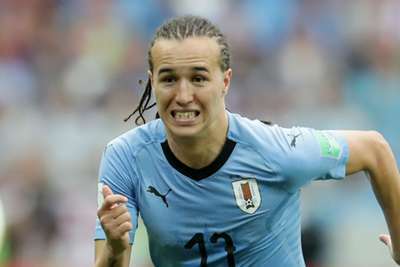 AC Milan have completed a deal to sign Uruguay international Diego Laxalt from Serie A rivals Genoa. The transfer was first confirmed on Serie A's official website, before the Rossoneri later announced the deal - worth a reported €18million - had gone through. Laxalt arrives at San Siro on the back of helping Uruguay to the World Cup quarter-finals and has spent the past three and a half years with Genoa. Last term, Laxalt - who operates anywhere down the left - made 32 Serie A appearances and scored three goals. It continues a busy transfer window for Milan, who have already signed the likes of Gonzalo Higuain, Mattia Caldara, Tiemoue Bakayoko and Samu Castillejo. Reports in Italy also suggest that the club are close to completing a huge swoop to sign in-demand Lazio midfielder Sergej Milinkovic-Savic, in which they will pay an initial €40million loan fee before making the deal permanent next season. Milan have also confirmed that Gianluca Lapadula has joined Genoa on a permanent deal with the striker having spent last season on loan at Stadio Luigi Ferraris.